Another kind is known as "Skeleton Jamb Linings," in which a skeleton framework is formed, and a single board, forming the stop, is nailed on the face as shown in Fig. 115. This should only be used for narrow walls, as the stop is liable to shrink and split. "Grounds" are required to all door openings in plastered walls, in order to provide a foundation and fixing for linings and architraves, as shown in Figs, 111, 112, 113, and 114. They are either slightly bevelled at the back, as in the case of skirting grounds, or may have a groove run in them to provide a keyfor the plaster. In thickness they are generally made out of 1-inch stuff, and their width is governed by the depth of the architrave. In cases where this would necessitate the width of grounds being more than from 4 to 5 inches they should be made up of a skeleton framework as in Fig. 116, consisting of styles and rails, and the width should be such that the architrave will not be more than 3/8 of an inch beyond the outside edge. They are nailed to plugs or fixing bricks in the wall, and should project 1 inch beyond the brickwork in the opening, and be connected across the face of the brickwork by 1-inch "backing pieces," about 2 inches wide, dovetailed to the edge of the grounds. They are sometimes fixed flush with the brickwork, but this is bad construction, as it either necessitates the use of folding wedges and "firrings" when fixing the linings (and these do not supply a satisfactory background), or the linings have to be fixed tight against the wall, which is worse still. Finishings are provided to door openings in the form of "Architraves." These consist of a moulding, fixed to each side and across the head, being mitred at the angles. They may be of various sizes and designs, and are either "single faced" or "double faced," and may consist of one piece or be built up of two or more pieces, in which case they are called "Framed" Architraves. A maximum width of from 5 1/2 to 6 inches should be observed for architraves of one piece. If wider than this they should be framed to prevent any liability to shrink and warp. 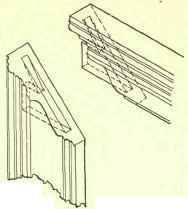 Small architraves may have plain mitres at the angles, but in the case of wide, heavy architraves the mitres should be grooved and cross-tongued, or they may be stub mortised and tenoned as shown in Fig. 117. "Plinth blocks" should be fixed to the feet of all architraves. These consist of small plain blocks forming a base to the whole, and fixed by either of the methods shown in Fig. 121 to the architraves. 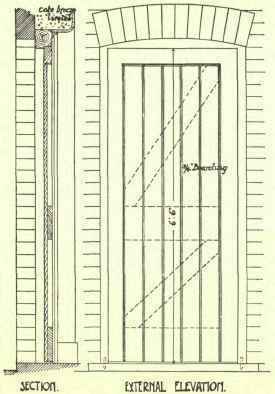 The common doors, such as are used for outside domestic offices and yard buildings, are usually of the kind known as Ledged and Braced or Ledged, Framed and Braced. These are made of battens of any thickness from 3/4 to 1 1/4 inch, according to the size and strength of door required. They are grooved and tongued together, match-boarding being frequently used, and have three "ledges" screwed or nailed across, as shown in Fig. 118. "Braces" are fixed across as shown, and are notched into the ledges at both ends. The braces and ledges should be slightly bevelled along the upper edge to throw off wet. 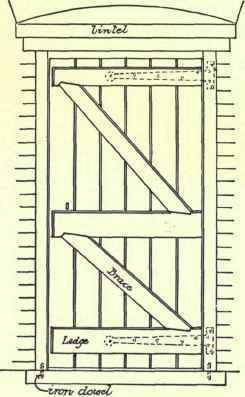 These doors must always have both braces fixed with the lower ends towards the hanging post to prevent "racking," or twisting of the door will otherwise result. "Ledged" Doors are sometimes made as shown in Fig. 119. They are similar to the foregoing, but without braces, and are not satisfactory, for unless they are very narrow they are sure to twist. 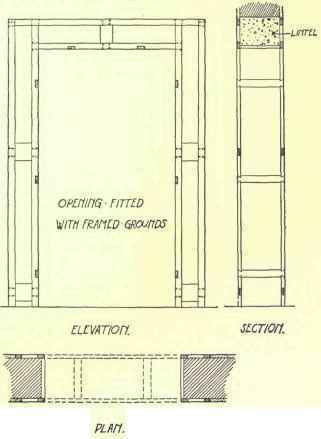 Ledged, Framed and Braced Doors, illustrated in Fig. 120, are similar to ledged and braced, but with the addition of a framework on three sides consisting of two styles and a top rail. The thickness of framing is equal to that of the ledges and battens combined. The battens are tongued into the styles and head, and the ledges are bareface tenoned into the styles. All joints in these doors should be put together with white lead or thick paint. 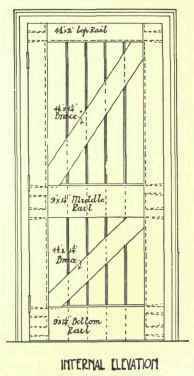 Ledged and braced doors are hung in nearly all cases on "Cross garnet "or "Tee" hinges, shown in Fig. 118. If fixed to the face of the door they should come opposite the ledges, if on the other side they should be screwed to the ledges. Framed and braced doors may be hung either with these or with butts. Rim locks or bolts are used as fastenings, while the latch is generally of the "Norfolk" or "Suffolk" pattern, with bow handle and thumb lever. A recent improvement in these latches abolishes the objectionable hook on the reverse side, and substitutes a second bow, thus having a bow and thumb lever on each side of the door. 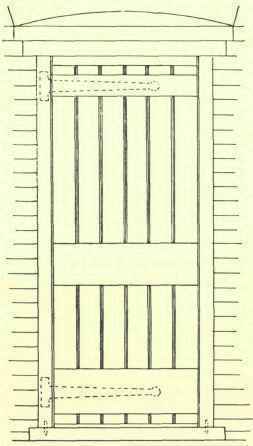 In descriptions of framed and panelled doors it is usual to first state the number of panels and then specify their kind, how moulded, etc. Panels fixed with the grain running vertically are called "Standing," and those with the grain running horizontally "Lying" panels.